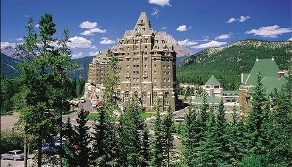 Scale some of the best climbing faces in the Canadian Rockies with the rock climbing tours offered by Banff Travel. Climbers of all levels and abilities will benefit from pointers and tips offered by qualified and seasoned guides who are trained by the Association of Canadian Mountain Guides (ACMG). You can choose between a full day (6 hours of climbing) or half day (3 hours) passes that includes rental of equipment, rock climbing shoes and instruction. Climbers are encouraged to bring a lunch, day pack to carry equipment to the climbing sites, comfortable clothing, hiking boots or running shoes, and a weatherproof rain coat.